Great produce, straight from the garden, is wonderful. Here in Wisconsin, where the growing season is so brief, gorgeous, straight-from-the-earth produce is a gift. I’m lucky enough to work with Brigid Ferkett, one half of the team that runs organic Gravel Road Farms. Their produce is both beautiful and delicious. So far, I’ve had some crisp ruby-red radishes, delicate white baby turnips, and multicolored carrots. Today I picked up some broccoli. They’d harvested the large heads earlier in the spring; these were the smaller florets that regrew from the original stalks. The crisp florets were nestled in deep green leaves. I wanted to preserve that sweet, fresh flavor. A brief steam to enhance the tenderness, a touch of lemon, and a few crumbles of salty feta were plenty. I had it warm as a light lunch, but it would be equally good at room temperature or chilled. It would be equally good with broccolini, and even tasty with grocery-store broccoli. The whole dish came together in a matter of minutes. 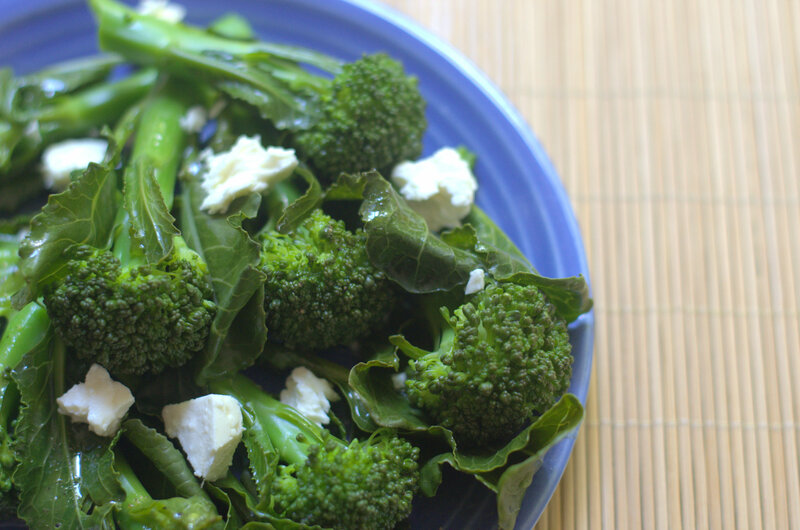 There’s just enough lemony dressing to enhance the fresh green broccoli. Feta adds a salty counterpoint. Cut broccoli into florets. Lightly steam until just tender but still bright green, no more than 5 minutes. While the broccoli steams, whisk lemon juice, olive oil, salt and pepper in a tiny bowl. If you’re serving the dish hot, just drain the broccoli well. To serve warm or room temperature, rinse broccoli briefly in cold water, then drain. To serve cold, plunge the broccoli in ice water for a few minutes, then drain. Lightly pat the broccoli to remove excess water. Toss the broccoli with the lemon dressing. Top with feta and enjoy. This entry was posted in salads, sides, vegetarian (or easily adapted to), veggies and tagged broccoli, feta, lemon, salads. Bookmark the permalink.